This painting depicts a woman in mid conversation in a public telephone box. Her figure is constructed through a series of repeated angular forms, so that she appears to be an extension of the stark geometry of her surroundings. It illustrates John Brack’s strategy of drawing viewers into his work by positioning them as direct and close observers of his subjects. While conversations normally imply connections between people, this work presents the act of communication as strained and isolating. 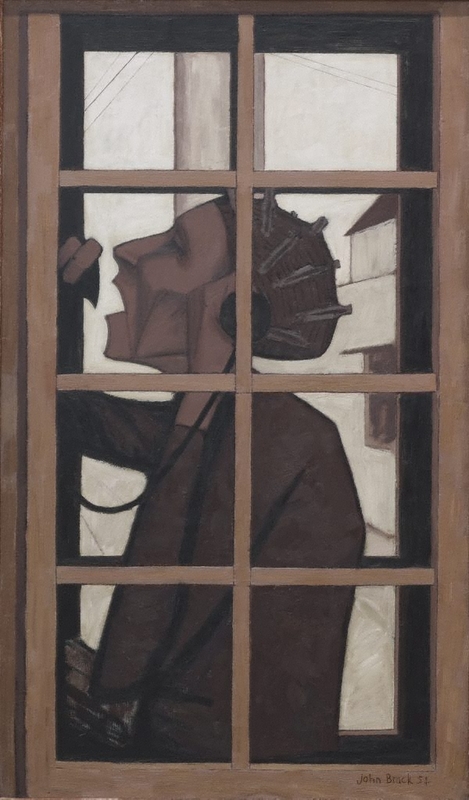 'The telephone box' is indicative of the powerful statements about urban experience that the artist exhibited in his initial solo shows in 1953 and 1955, which established him as a significant presence in Australian art. Signed and dated l.r. corner, black oil "John Brack 54". Alan McCullock, The Herald , 'Style and subject', pg. 22, Melbourne, 09 Mar 1955, 22. Exhibition review, general reference. Denise Mimmocchi, Look , 'Instilling the familiar with a lurking sense of uncertainty', pg. 29, Sydney, Jul 2011, 29 (colour illus.). Natalie Wilson., Foundation Newsletter #18 , 'Curators & Coordinators' reports', Sydney, Jun 2011, (colour illus.). The art of John Brack - Volume 1 , 'The urban icons', pg. 37-53, Australia, 1990, 47. City art , Victoria, 1978, 31 (illus. ).